Home: My San Francisco AIA San Francisco Center For Architecture + Design Gallery San Francisco Through October 31 Home: My San Francisco is an exhibition designed by Julie Blankenship in collaboration with photographer Julie Sadowski examining the rapidly evolving design of domestic space in response to changing views of identity, family, work, life, technology, and sustainability. The show captures the narrative environments contained within the city’s indoor and built environments through photographs, supplemented with an online collection of images, interviews with residents, architectural drawings, and texts. Contents span a wide variety of architectural styles and neighborhoods, including single-family homes, contemporary renovations, cohousing, and multi-family residences. 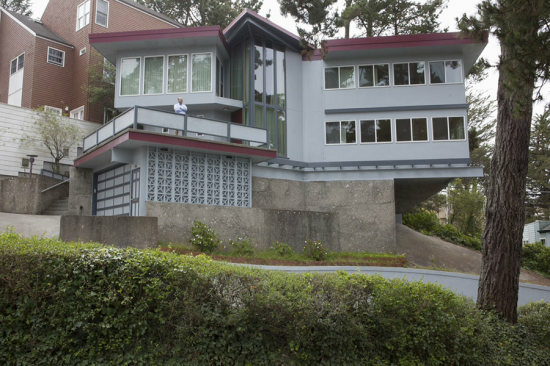 A few of the examples are Curran House, high-density affordable housing in the Tenderloin by David Baker Architects; Embassy in Lower Haight, an example of creative cohousing and the home of Reallocate.org; and a mid-century Forest Hills mansion built for baseball hero Willie Mays by Al Maisin. In one of the few towns where the AIA has serious pull, the AIA San Francisco has named Jennifer Jones as its new Executive Director. Longtime HMC principal Kate Diamond has left her position and is looking for a new job. While it pales in comparison to the news that AECOM has merged with URS, forming the biggest firm in the galaxy, WSP has bought “global design giant” Parsons Brinckerhoff for $1.35 billion. That’s no joke either. 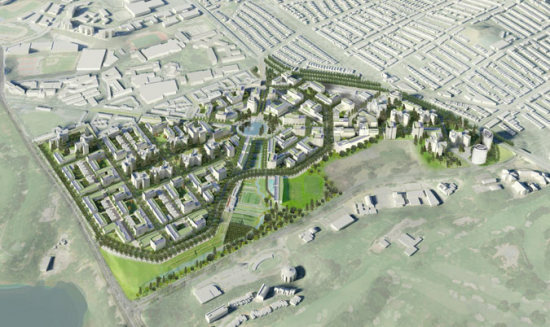 Finally, after more than six years of waiting, SOM has begun work on its massive redevelopment of the WWII-era housing development, Park Merced. In San Francisco that’s like waiting for fifteen minutes. 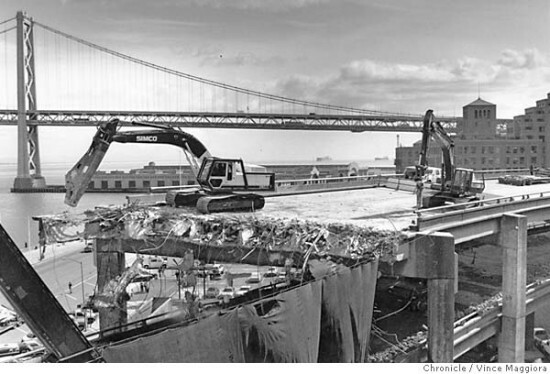 San Francisco's deputy mayor for transportation—who played an integral role in getting the city to tear down the Embarcadero Freeway after the 1989 Loma Prieta Earthquake—passed away on July 30th. He was 68. After the earthquake struck the city, Wright convinced former San Francisco mayor, Art Agnos, to help lead the effort to remove the highway and replace it—not with another highway, but instead with a boulevard at street level. In the 1970s, Wright worked as the planning director in Portland, Oregon. He set a major urban planning milestone in the United States: he got the city to take down a large portion of Harbor Drive, a highway along the Willamette River and build a park—the Tom McCall Waterfront Park (named after former Oregon governor, Tom McCall)—in its place. In many ways his actions were visionary, setting a precedent for large scale urban freeway removal projects. In later decades, other cities let go of portions of their elevated highways, such as Boston, Milwaukee, and Seattle. Seattle is currently in the midst of boring the Alaskan Way Viaduct replacement tunnel and planning a major redevelopment of the waterfront, designed by James Corner Field Operations. "I hate the word 'vision,' but he had a vision as to how transportation should be part of larger efforts to sustain the urban environment," Rudy Nothenberg told the San Francisco Chronicle. She was a colleague of Wright and San Francisco's former chief administration officer. "More than anyone I worked with, he was the kind of person you would want as a fermenter of ideas and possibility." 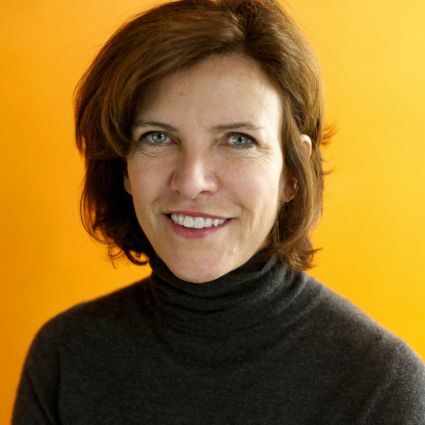 We've known for some time that Chicago architect and certified genius Jeanne Gang has been planning a residential tower for San Francisco's Transbay District, south of Market Street. Now we know what it will look like. Gang and developer Tishman Speyer have revealed renderings of a 400-foot-tall, 40-story building clad in masonry tiles at 160 Folsom Street. Units would contain large bay windows, a staple in the Bay Area. But the bays will jut out at sharp angles and change configuration as the building rises, creating what appears to be a twisting tower profile. "What I like about tall buildings is what you do with the height, the incremental moves along the way," Gang told San Francisco Chronicle critic John King. Studio Gang and Tishman Speyer both told AN that Gang could not comment at this point in the process. 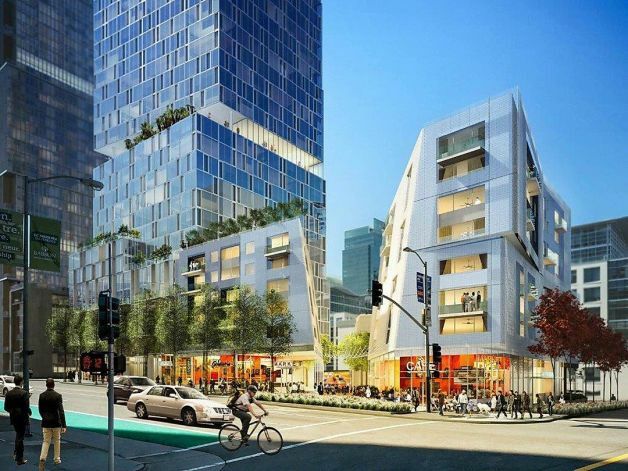 Thanks to a deal with local officials in which the building was granted another hundred feet of height, the development, located about a block from the Embarcadero, will—if approved—contain about 35 percent affordable housing. That's the same figure the overpriced city is hoping to achieve for future developments. Currently all projects in San Francisco are required to set aside about about 12 percent of their units as affordable, lest they pay a fee. The Transbay District, anchored by Pelli Clarke Pelli's Transbay Center, is now set to contain new buildings by Studio Gang, Pelli Clarke Pelli, Renzo Piano, and OMA, a remarkable conglomeration for an area that just a decade ago was a relative afterthought. Overall the district is set to contain more than six million square feet of new office space, nearly 4,400 new housing units, and about 100,000 square feet of new retail space, according to the Transbay Joint Powers Authority. Known for his political activism and for art that spans east and west, Chinese artist Ai Weiwei will hold an exhibit on Alcatraz Island this September. 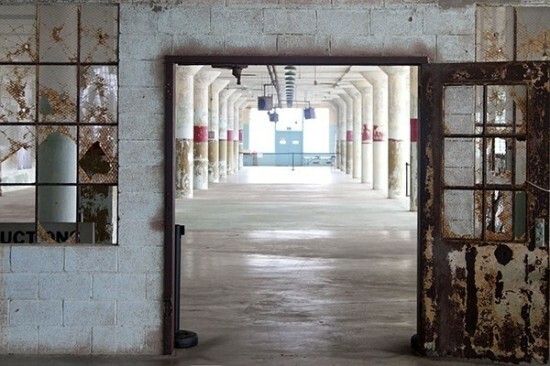 The show will include seven works at the notorious former federal prison—with partners including the Golden Gate National Parks Conservancy, the National Park Service, and the For-Site Foundation. The installations will be spread throughout Alcatraz, including the 1941 New Industries Building, where prisoners worked in manufacturing or did laundry for local military bases. The A Block section of the 1912 Alcatraz Cellhouse will also open. It included solitary confinement cells as well as ones that contained typewriters and legal reference books. There will also be installations in the hospital and the Dining Hall, according to Architect. Ai Weiwei is a prisoner of sorts himself. He will work on the exhibit from China, since the Chinese government has barred him from leaving the country since 2011. To help visitors understand more about Weiwei's installations, guides will be stationed throughout Alcatraz, to be funded by a currently-in-progress Kickstarter campaign. The exhibit will run through April 2015. 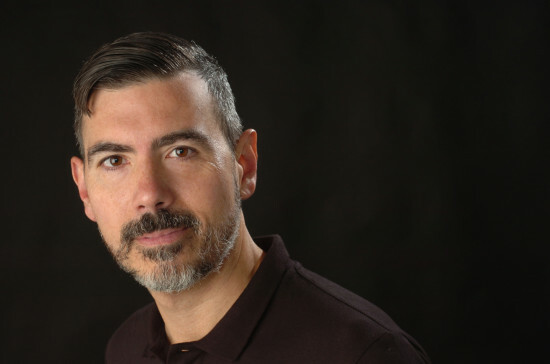 In the second significant departure this week from the Syracuse University School of Architecture, professor Jonathan Massey has been named the Director of Architecture at California College of the Arts (CCA). Massey, who chaired the Bachelor of Architecture program at Syracuse from 2007 to 2011, succeeds Ila Berman in the position. Although he spent four years in Los Angeles, Massey is new to San Francisco, and admitted, "I still have a lot to learn." So far he said he's impressed with the school's focus on digital craft, its ability to "tap into a broader Bay Area culture of innovation," its diversity of offerings, and its commitment to social justice. While it's too early to set out an agenda, Massey is interested in plugging faculty and students' digital skills into a larger framework, through municipal data, social media, and other means. He wants to connect a strength in formalism with political and social issues—what he called "socially engaged formalism—and he would like to expand the school's regional and global partnerships. Many of these initiatives, he posited, are likely already there, but may be "ready to be developed further." Massey holds a doctorate in the history of theory and architecture from Princeton, a master of architecture from UCLA, and a bachelor of arts from Princeton. MOD, the newly-created furniture wing from San Francisco architecture firm Min | Day, will be unveiling three new pieces at ICFF next week. By making use of the human inclinations to rearrange and reconfigure, the pieces grow through a simple geometry of addition and subtraction. All three styles utilize playfulness and improvisation to create topological terrains. The AVA is a steel storage system that on it’s own can be used as a stool or small table, however, when combined with more than one unit it can quickly become a complex shelving system, room divider and space converter whose precise tonalities along with its lightweight metal and shifting angles create inherent drama. Soft Stones furniture is comprised of eight unique components that transform from a lounge when fitted in place to individual seats and small tables when broken apart and scattered throughout a room. 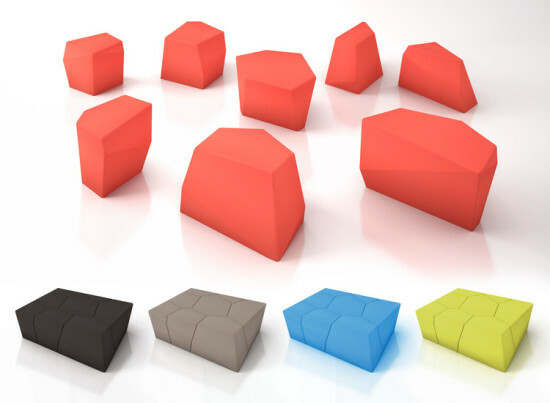 The line is constructed out of steel, foam, and upholstery fabric and comes in five colors. It resembles, perhaps, an undiscovered geologic formation, as it’s geometry pervades a muted yet playful interpretation of shattered boulders. 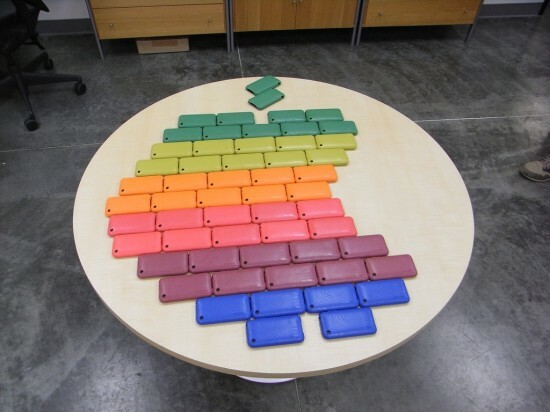 Pentables, a five-sided table system originally designed with students at the University of Nebraska is made of welded steel and goes together quickly. It grows in similar ways to the AVA system, where it can exist on its’ own but can also be added to with additional units. Like many major tech companies in Silicon Valley, Apple provides free transportation for its employees living in the Bay Area. About 28 percent of Apple employees do not drive to work, instead taking employer-owned biodiesel shuttles, biking, or walking. In an effort to bring that percentage up to 34 percent (a figure that will help get their new Norman Foster–designed campus in Cupertino approved), the company is expanding its fleet of buses and building a dedicated transportation center. With an annual budget of $35 million—that's approximately $21,000 per employee—the Transportation Demand Management program, as it is formally called, provides an average of 1,600 employees a free ride to work each day. Shuttles owned and operated by companies such as Google and Apple have sparked recent protests, prompting the San Francisco Municipal Transportation Agency to approve a new plan: company shuttle buses will have to pay $1 for every stop made, every day. The proposal is set to go into effect this July and raise $1.5 million over the first year and a half. More info at the Los Angeles Times. Despite its collection of near-misses in California (LACMA, The Broad, Universal, etc. ), OMA and Rem Koolhaas keep trying to land a headlining project in the Golden State. And it looks like they're about to design a high rise in San Francisco to accompany their (currently on hold) winning scheme for a mixed use project in Santa Monica. San Francisco’s Office of Community Investment and Infrastructure (the successor to the city’s Community Development Agency) has given the firm initial approval to design a 550-foot-tall residential tower on Folsom Street, between First and Fremont streets, in the city’s Transbay area. The project features OMA's tower on one end of the block with podium buildings and townhouses filling the remainder of the block. The tower, and the accompanying row of low rises designed by Fougeron Architects on Block 8, will be a mix of 4,400 condominiums and rental apartments, with at least 27 percent of them affordable. CMG will be the landscape architect, and the developer is Related California. 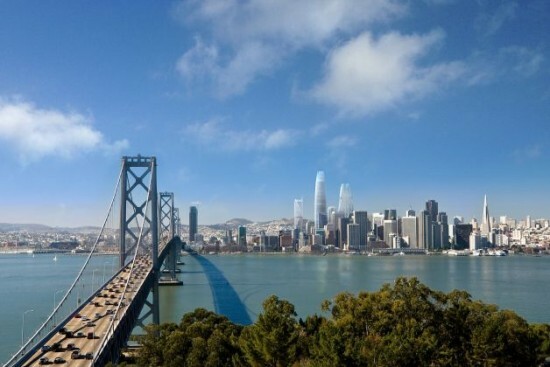 OMA said that it could not yet release images of the design, although several press outlets have released a rendering (at top), including the San Francisco Chronicle. 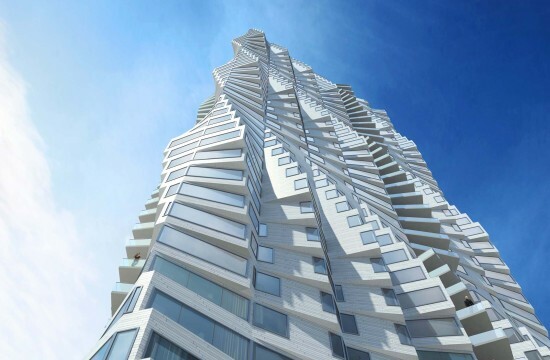 OMA becomes the second starchitect-firm in a matter of weeks to take on a skyscraper in the city, after Jeanne Gang recently signed on with Tishman Speyer to design a tower in the same neighborhood. Both towers will be located near Cesar Pelli's Transbay Tower, now underway. The 40-acre Transbay area has been witnessing major developments since the city and county of San Francisco adopted plans to redevelop the area in June 2005. Under the plan, the city divided the area into two sections. Zone One encompasses a ten-acre segment of vacant public land where a portion of the Embarcadero Freeway once stood and will include a mix of residential, retail, and public open space, as well as a one-acre park. Zone Two will include the new Transbay Transit Center and the 1,070-foot-tall tower by Pelli Clark Pelli Architects. The plan is set to expire in 2035. More planning details on Block 8 in a report by the Office of Community Investment and Infrastructure here. And more on the Transbay redevelopment project here. Since the east span of the Bay Bridge opened in the fall of 2013, demolition crews have been busy deconstructing the old–taking down over 50,000 tons of steel. While most of the steel will be sent to China as scrap, one Bay Area entrepreneur, David Grieshaber, wants to save a portion to create a mixed-use building, housing a museum, a private apartment, and an Airbnb rental. The Airbnb fees would, hypothetically, keep the non-profit undertaking running. 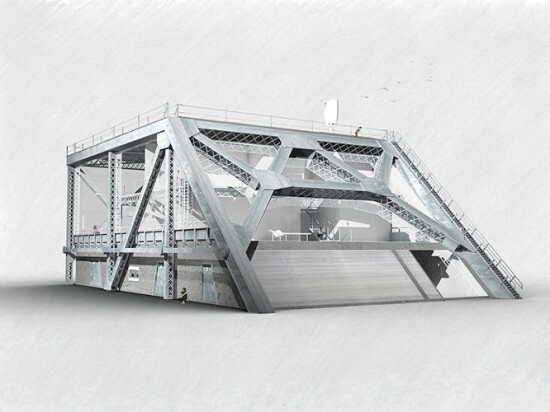 The frame of the project would incorporate the original steel beams (about 1.3 percent of the total bridge) and the floors would use the pavement (and even keep the lane markers). The design would also feature green systems such as rainwater collection, solar panels, and a green roof. The final location for the house has yet been determined. More info on the Bay Bridge House, here.